This indicates that the Government of Canada is implementing its plan of attracting more number of immigrants. In the recent times the objective of IRCC has been 'to put greater weight on human capital, skills and experience. 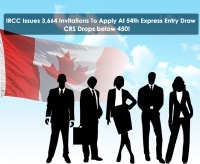 Year 2017 looks good for candidates already in the Express Entry pool and also for individuals planning to migrate to Canada.